$4,300.00 (1986) . . .
40vp-p @ 40ma max or into 500ohms min.up to 1MHZ sine/square and 10KHz tri/ram. The main out put provide sine from 1uHz to 20.999999999Mhz, AUx out on rear 21Mhz to 60.9 Mhz square wave, Square wave 1uHz to 10.999999999Mhz, tri/ram 1uHz to 10 Khz, it also has swwep fuction, am modulation and phase modulation. 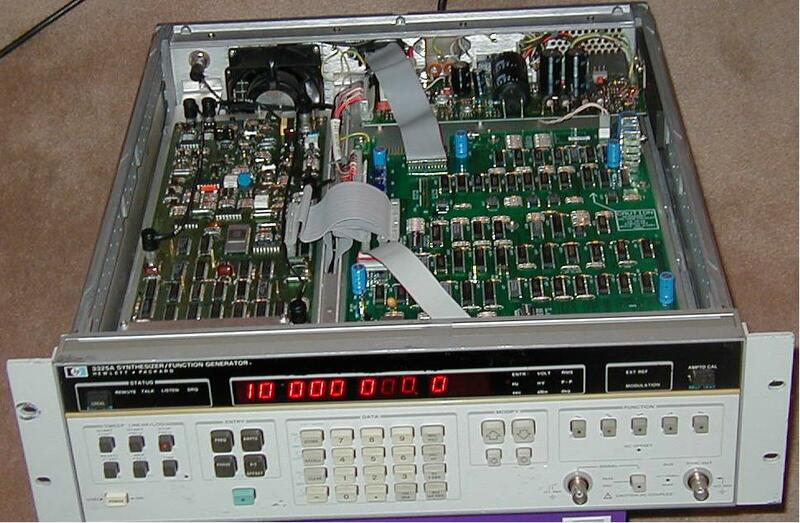 The 3325A Synthesizer / Function Generator is a versatile and precision synthesizer providing frequencies from 1µHz to 21MHz (sine), 11MHz (square), and 11kHz (triangle, ramps). Frequency resolution to 1µHz below 100kHz and 1MHz above 100kHz are provided by the 11-digit display. Excellent choice for ATE Systems, completely HP-IB programmable! The 3325A includes a log/linear sweep function with variable sweep time and marker out, external AM and phase modulation, and variable phase offset when connected to another 3325A. Ten storage registers allow one to quickly change front-panel setups. Output is rated at 1 mV to 10 V p-p into 50-ohms. Frequency stability for OPTION 1 is an aging rate of ±5x10E-08/year. for 50 kHz to 200 kHz -60dB and 200 kHz to 1 MHz -40dB. Overshoot: <10% of peak amplitude with same load.